When Charlotte Harrison was born in 1995, she was in perfect health and was eagerly welcomed as the third child in a loving family. She progressed normally for 18 months until her mother, Jenny, noticed she was losing weight and not thriving as she should. 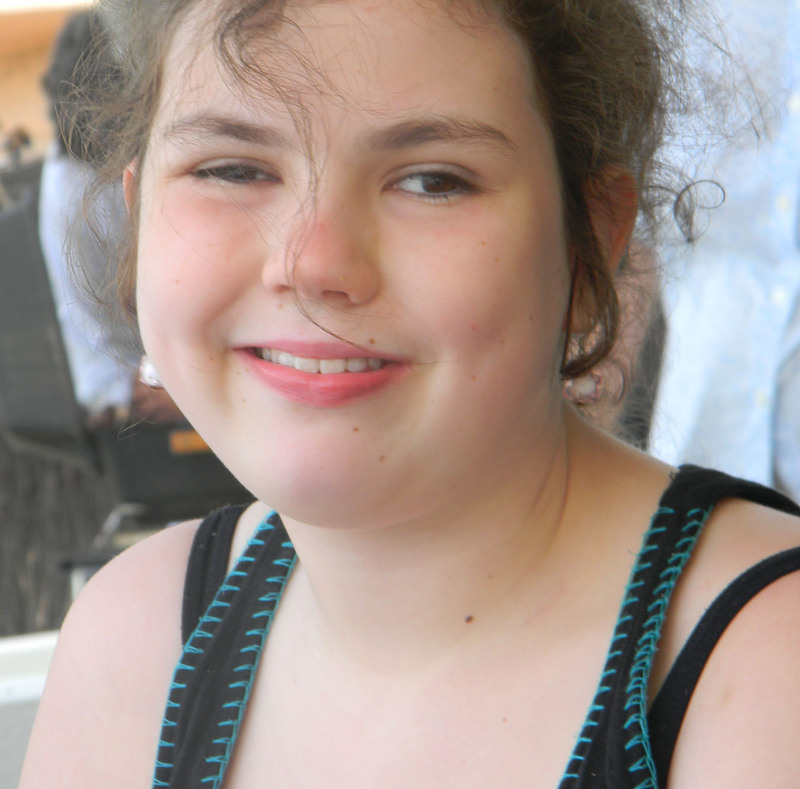 A check-up led to further tests and Charlotte was finally diagnosed with a brain tumour. A rare syndrome, caused by the tumour, was responsible for the weight loss. Tiny Charlotte underwent major surgery in an attempt to reduce the bulk of the tumour but this was only minimally successful and, at aged two, she needed a shunt inserted into her brain to drain fluid which had become blocked by the tumour. When she was just three years old, Charlotte’s vision atrophied to the effect of the tumour on her optic nerve. The following three years were an emotional journey for the whole family as Charlotte needed intensive chemotherapy treatments – many of which caused severe side effects. Seven weeks of daily radiation therapy when Charlotte was four-and-a-half years old resulted in a severe memory deficit and ongoing learning difficulties. Jenny Harrison describes the harrowing journey of medical intervention that has taken place: “Between the ages of one-and-a-half and six years of age, Charlotte had 30 operations due to blocked shunts and a variety of issues resulting from both the tumour and the chemotherapy. She has lifelong health issues as a result of the cancer and the treatment and, although the tumour is currently inactive, she remains at risk of developing further tumours or leukaemia as a result of the radiation therapy”. The family suffered a further setback when, two years ago, Charlotte suffered a stroke which left her completely paralysed on her left side. It is suspected that the combination of side effects from the radiation therapy and pressure from the tumour caused the stroke. It was a blow for the family as Charlotte became fully dependent and required full-time care. She was unable to attend school for nine months. An intensive course of physiotherapy and occupational therapy saw Charlotte make progress towards some recovery and she now walks with a leg brace. Although she has not regained complete mobility and continues to experience difficulty with her left hand and arm, her ongoing occupational therapy and specialist neuro-physiotherapy exercise programme continues to be a positive influence on her abilities. Charlotte is now back at school full-time and very much enjoys attending St Edmunds Special School in Wahroonga. She was even elected school captain for 2012. “Through it all, Charlotte has amazed us with her ability to be cheerful, kind and thoughtful. She never complains and seems to take all of this in her stride,” says Mrs Harrison proudly. Dance has been a love of Charlotte’s since she started at Jdance Performance Studios in Marsfield at age six. She joined her two sisters, now aged 20 and 14, who had danced there since they were four. A warm welcome was always extended to Charlotte and, for the three years leading up to her stroke in 2012, she assisted Principal Jennifer Engelmann with the pre-school dance class. “Jdance has been such an amazing support to our family,” explains Mrs Harrison. “And we are continually grateful for the love and care extended to all of us”. In December 2011 the family received an incredible gift from the Make A Wish Foundation. Charlotte’s wish was to see her sister dance at Disneyland as part of the Jdance Performance Studios’ trip to the USA in October this year. The Make A Wish Foundation has generously arranged for Charlotte to join the tour, together with her parents. As a happy coincidence, Charlotte will celebrate her 18th birthday while on the tour. While Charlotte’s future may be uncertain, the family will continue to focus on the joy and happiness that Charlotte continues to bring, and do whatever they can to ensure that her bright and sunny smile continues to shine. So, she is gone. My youngest, and last, child was delivered into the welcoming arms of our local primary school this morning to start her educational journey. And now the house seems so quiet. I don’t know whether to laugh or cry…somewhere in between seems to be my body’s natural reaction so far. Together we have counted down the days, bought school shoes and uniforms, packed school bags, purchased myriad supplies, and filled in countless forms. And finally, inevitably, the day has arrived. I had been looking forward to this day with the attitude that, finally, I would have some peace and quiet. A chance to get stuck in to my ever-growing To Do list. The last couple of weeks of school holidays were trying times for us all with the children squabbling, unused to spending so much time together. In particular, the amount of wet weather in Sydney didn’t help, keeping us all stuck inside for much longer than we are all comfortable. Yet, now that she is gone, I feel her absence so keenly and long for her to sneak into my office, snake her little arms around my neck, and plant a wet kiss on my cheek. From feeling as though my head would explode if I heard “I’m bored” one more time, I now yearn to hear her voice. I am so proud of the way she handled herself this morning. Confident and happy, she chattered excitedly to me as we walked down the hill to the school. Even the constant drizzle couldn’t dampen her mood. When we arrived and were sorted into classes, she quickly and efficiently stowed her bag then took herself into the classroom, sat at a table and started drawing. With not even a glance backwards to see if I was still there. I commented dryly to another mother that I almost wanted her to be a bit clingy so I could feel just a little bit missed but I was quickly set straight that this way is much better for both of us (with which I do agree). For my daughter one door opens. And for me this signifies the closing of another. As with my older child, my role in their life will change as they become more influenced by their friends and social circles, as they grow and develop their own opinions, likes and dislikes, and as I start to let out the apron strings just that little more. So fly and be free, my gorgeous girl. I’ll always be here to catch you if you fall. Do you have a child starting school this year? Or, if you have older children, what was your experience? Last night I decided to introduce a new game over dinner. Now, I’ll say upfront that we rarely encourage games or playing during meals – it’s hard enough getting them to focus on eating without added distraction. But this was a discussion game and I thought it might make a change from our usual “How was your day?” “Good” dinner table conversation. I could almost see their eyes light up – they just knew this would be an easy game. Then I dropped the bombshell. The characteristic they chose couldn’t relate to how the other person looked. Now, for two girls obsessed with fairies, princesses, dancing, makeup, jewellery and bling, this must have seemed an insurmountable task. Which, of course, is exactly why I did it. I don’t believe my children are unduly focussed on their looks but I am aware that they focus very heavily on exterior characteristics when deciding who and what they like. If asked why they like Tinkerbell, for example, they’ll tell you she’s pretty. If asked why Barbie is a favourite, I’ll often hear about her hair or clothes. And so on. So I wanted to challenge them to look a bit deeper at the people they know very well. I think with siblings and close family members it’s easy to forget to look at who they really are as a person because they are always around. In a way, we take these people for granted because of both our physical and geographical closeness. I’m happy to report that, after a few false starts, my girls cottoned on to the game with gusto and we spent quite a long time complimenting each other about all our qualities that don’t relate to how we look. Some commentators believe strongly that we should never tell girls they are pretty or beautiful for fear they will develop a complex about their looks and this could lead to larger issues such as eating disorders. I’m not so sure about this – purely from a practical perspective. To me – my girls are beautiful and they always will be. I don’t think telling them that is going to harm them…as long as I also recognise, compliment and celebrate all the qualities that go into making them who they are – their laugh, strength, sense of humour, kindness, compassion, generosity, talents and so much more. It was particularly gratifying to hear the girls choose special qualities about their sister – particularly after the regular sibling squabbles we’ve been dealing with during the holidays when too much time together has caused rifts to develop. This is a game we’ll definitely repeat. How do you feel about complimenting girls on their looks? Do you have daughters and, if so, what strategy do you employ? This week I read the shocking news that another teenager, 14-year-old Sheniz Erkan, had taken her life as a response to consistent bullying. The debate around bullying, and how to manage or curtail it, has surfaced again with many keen to share their own experiences – either as the bully or the bullied. I feel very strongly that it’s important we share all stories – both to understand each side of the scenario (for how can we combat something we don’t understand?) and to ensure that those currently being bullied do not feel alone. I was the victim of bullying in my early years at high school and when it happened I was completely blindsided. Having come from a very friendly, happy and social primary school where I had a gregarious group of friends, I was absolutely unprepared for the fact that I could be targeted in this way. It’s interesting that, in searching my memory, I find I can’t picture my bully’s face very well but I can certainly recall, too easily for my liking, the knot in the pit of my stomach and how my body would flush with heat (my flight-or-fight response was obviously well-attuned) when I saw her coming. I still don’t know what I did (probably nothing) or why I became her target but it was clear that she had singled me out from early on in Year 7. Two events remain with me, as clear in my mind as if they happened yesterday. My hands have just clenched unconsciously above my keyboard as I picture them. Most of the bullying was verbal but one day, I don’t know or can’t remember why, she decided to get physical. I was standing in front of one of the long, low silver bench seats that are so loved in our schools (you remember, the ones that would get really hot in the sun and take off a layer of skin if you sat down before checking?). The bench seat was positioned in front of a brick wall and, as she walked past me, she shoved me hard in the chest. I don’t think she even looked at me as she did it. The only recognition that she even knew I was there was the connection between her hand and my chest. I was taken by surprise and fell backwards, cracking my head hard on the brick wall. The second event is a memory of myself, in a classroom, probably sitting at the back in an attempt to remain unobtrusive. I can picture my writing on the paper in front of me. I am writing as small as I can possibly make the words on the page, my head is bent down almost touching the paper. I have the strongest sense that if I make myself and everything I touch as small as possible I might just be able to disappear. I know I changed during this time but you’d probably have to ask my parents for an objective assessment of how much. I know I put on a brave face and outside school I had many interests and friendship groups to distract me. I know the experience has affected me far beyond my school years and I can see the legacy of that time in some of my relationships today. Although, it must be said, that an adult’s perspective allows me to recognise this, accept it and make different choices – skills I was not equipped with when I was 12 and 13 years old. I was lucky to have supportive parents to whom I felt I could confide. They were obviously aware of what was going on and I do remember having a couple of meetings with the school but these must have been unsatisfactory because, at the end of Year 8, my parents moved me to another school. I will always be grateful for their support and, although I know some counsel staying and dealing with the problem, I found the move to be just what I needed. I still had trouble making friends at the new school which was compounded by the fact that I was starting two years after everyone else so friendship groups we well established by the time I arrived. My story has a happy ending in that I was able to move on and eventually forged a number of amazing friendships for which I will be eternally grateful. But I have never forgotten that time and I can only hope that, if my children are ever in a similar situation, I will be able to find the distance and objectivity needed as a parent to help them deal with it. Do you have a bullying story? Or were you a bully and regret it? Have your children been the victim of a bully? If so, how did you (or are you) dealing with it now? I’m a sucker for a good “memory” story and love nothing more than listening to someone reminisce, particularly if the tale relates to a time before I knew the storyteller. I feel as though I’m being welcomed into a hidden part of their world and I always discover something new and exciting about the person, even if I know them well. I’m particularly interested in early memories and how some people can have such clear recollections of times when they were very young. My own early memories are less film-reel clear and more a hazy, ethereal jumble of images which may or may not relate to a single moment in time. I have extremely patchy memories of my brother arriving when I was two years old and I can vaguely picture my mother holding a small bundle. I can clearly visualise the outside of the house we lived in at that time but, try as I might, I cannot recall any sense of the interior. Many of my memories tend to be more a recollection of a certain feeling rather than a particular visual image. I remember being very scared about a large dog barking at me from behind a fence one day when we were out for a walk – I would have been around four years old. I don’t remember anything about what the dog looked like or where we were but, even today, I can hear its bark and remember all too clearly the shock of that sudden, loud noise ringing in my ears. My memories are also tainted with other information and supplemented with photos or stories told by various family members. My father has a particular story he likes to tell about my first day of school and I’ve now heard this tale so many times (and I’m sure it’s become embellished over time) that I’m not sure how much is my own memory and how much has been absorbed via listening to the story over and over again. Some of my friends can recall the name of every teacher they had through primary and high school. I can tell you with absolute assurance that I loved school, particularly early primary school, but the names of my teachers have not stayed with me. I’m also aware that some of my memories are tarnished with a child’s viewpoint which is at odds with my adult understanding of the world. And, as I grow further from my childhood memories, I’m aware that the simple passage of time will steal details and fuzzy the edges to make it harder for me to distinguish dates, times and places. What’s your earliest memory? Are your early memories crystal-clear? Or, like me, are they a bit fuzzy around the edges?